We're so pleased to have so many Knickernappies sightings on the world wide web! From cute pics of babies in their KN diapers to KN product reviews and KN sales there's always something going on! This week's no exception! At My Little Slice of Mommy Heaven you can view action shots of MommieV's daughter modeling the Violet Knickernappies Onesize that she won through one of our recent giveaways! We're so pleased that she likes it and she of course looks adorable in it. Over at Go Green Wisconsin's Blog you can read an excellent review of the Knickernappies Onesize diaper by Jamie, purchased at My Baby Pumpkin. Jamie had great things to say about our award winning onesize. Want to read more about this review head on over to Go Green Wisconsin! Knickernappies is also April's Manufacturer of the Month over at Wee Little Changes Blog! Head on over there to read the interview. 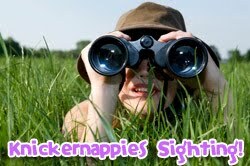 Also, check out WeeLittleChanges offer of a 15%off Coupon for your honest reviews of the Knickernappies OS Diaper! Details can be found on the sidebar of their Blog! Do you have a Knickernappies Sighting to share or will you be creating one? Send your sightings to marketing(at)knickernappies.com and you just may find yours featured here on the KN Blog! Awesome! Great to keep hearing good things about Knickernappies. I'll definitely be trying one on my baby when he/she is born! !